Here's a pic of my bike, looks sad though. As it sits, it's running nice. Is is running '85 600cc ninja carbs, 61mm pistons and sadly a 550 stock cam with a slotted cam gear. Yes the thank looks ratty, had to remove stickers. And I made the seat, it is fiberglass and it has no padding. Fits me like a glove though. For my 62mm pistons I modified kz650 pistons to use cb750 +1mm rings. Stock cb650 cylinders bored and honed. Suzuki GSXR rods to replace the stocked ones. Going back to a 650 cam. Not sure I want the slotted gear or not though, I made the piston valve reliefs a tad closer than stock. But i got one recently!!! 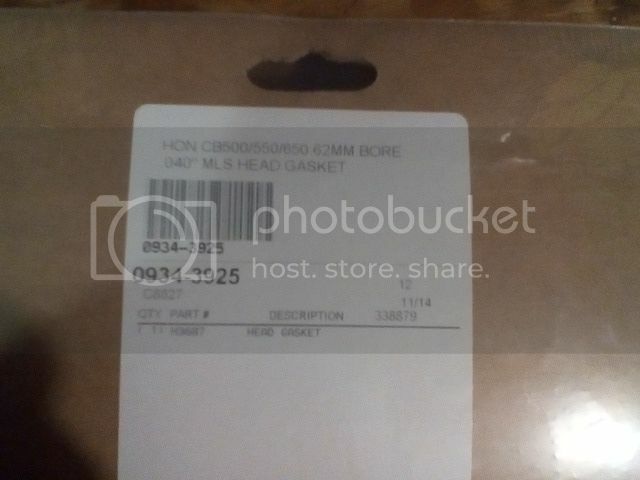 Not what I expected, but I've never dealt with custom mls gaskets before. Looks good to me. 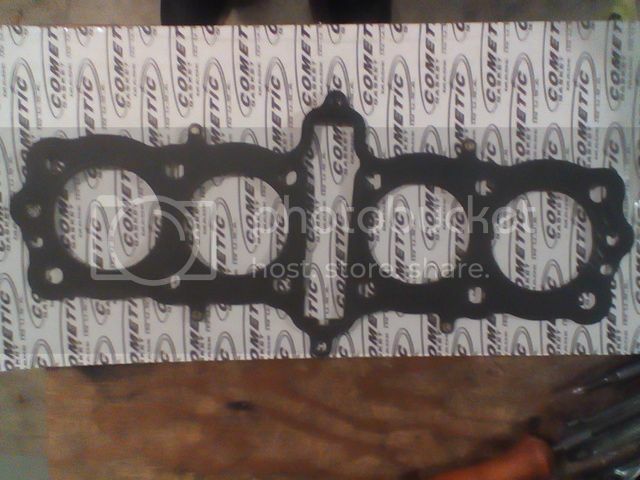 A sight better than the stock head gasket I reused for my 61mm pistons. 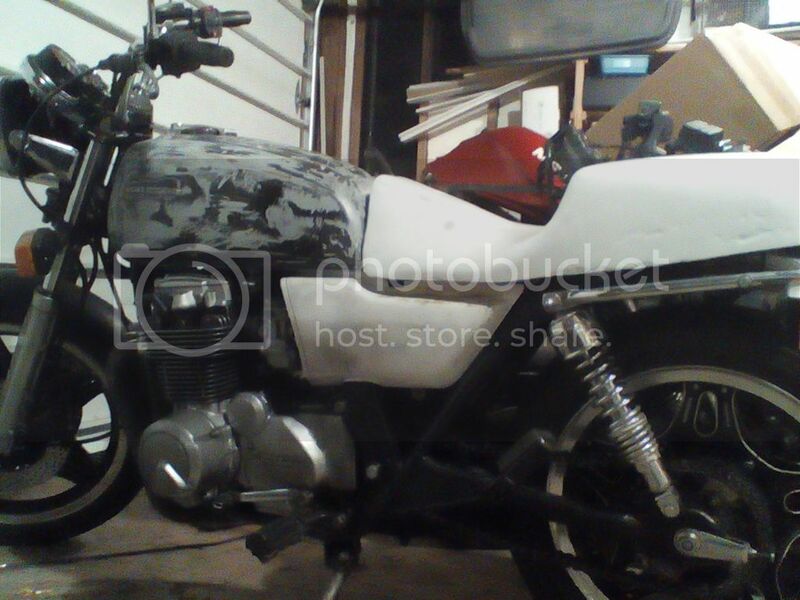 Re: My '79 cb650 62mm overbore project. Here is the cabinet -o- parts for my 650. 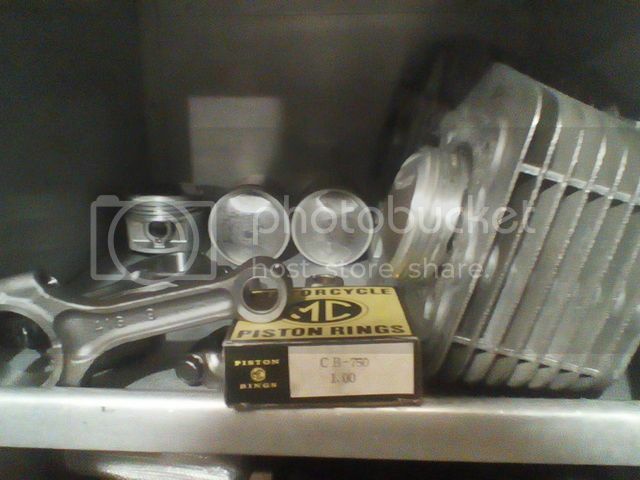 The bottom area is cb650, and cb550 overbore pistons sets, fixtures, and fabrication prints and notes. 66, 64.74, 62, 61 cb650 overbore sets, and 61mm cb550 pistons. Middle area is stock replacements section, mostly electrical. Top area is where the overbore parts are migrating to. I love the rods, out of all the technical bull I had to sift through, that's the gem in my opinion. Who would have thought a modern litre bike would share exact rod dimensions with a cb650? Here's a better look at a rod, the ring box with label, and the pistons. 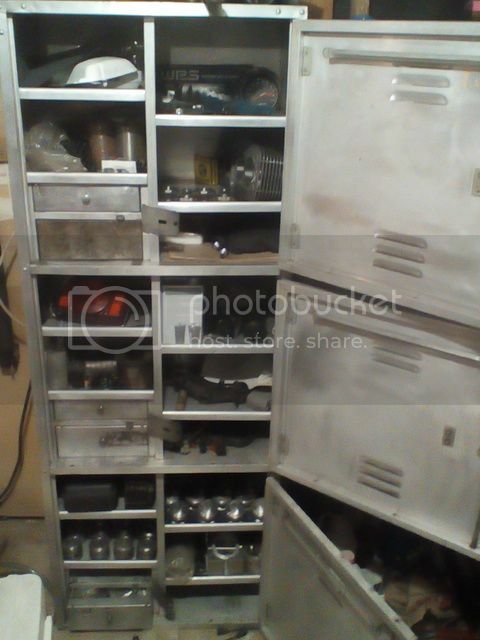 Interesting project and great parts cabinet. I remember several interesting frame mods but I think here are few projects that go that deep into the engine. Probably because the chassis is already charged well enough with the stock engine power. There is the project100mpg of member pinhead who also went into the metallic interior of the CB650 engine. There flow issues like port and chamber turbulence were key issues and he upgraded the ignition significantly, too. Unfortunately the pictures seem gone. The head oil leak is rather caused by the O-rings than by the head gasket itself. In case the cometic gasket is a unique copy it might be worth considering something like that. However I never tested it and it does not look like it was taken up by someone else yet. I've been debating whether or not to put my 62mm pistons in the stock motor under my bench, or use the one with the worked over head that has the 61mm overbore in it already. Decided the flow benched head should be paired with the overbore, so I'm tearing into a known recently running motor in hopes to avoid any issues. Don't like that motor as much, low miles, but a threaded lug is broken off for the charging system cover mount, not sure it it would be a leak. Only ran the motor a little before pulling it, enough to verify no knocks in the motor. Or a few, was wanting to replace the outter 4 at a minimum.